This was the perfect finish to a big, meaty, meal. 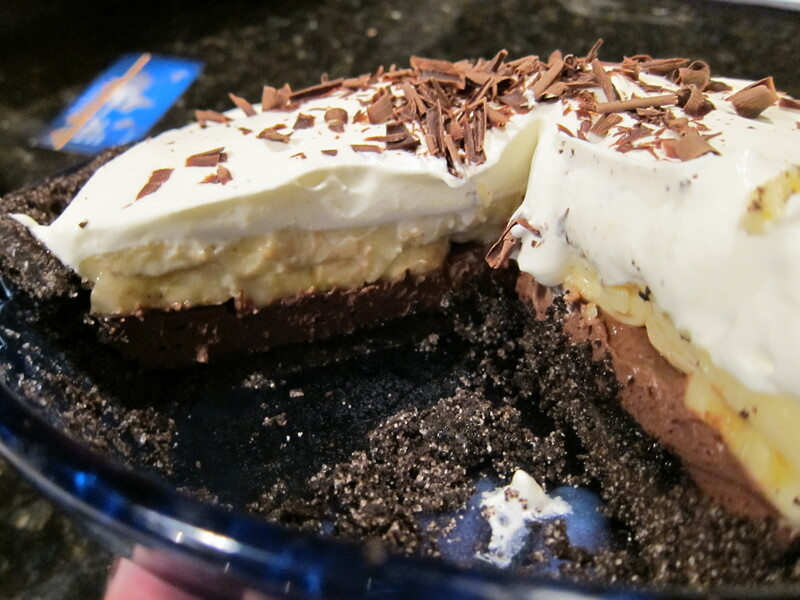 The pie consist of a chocolate wafer butter crust, with a layer of chocolate custard, a layer of fresh bananas, a layer of vanilla custard, topped with whipped cream and chocolate shavings. 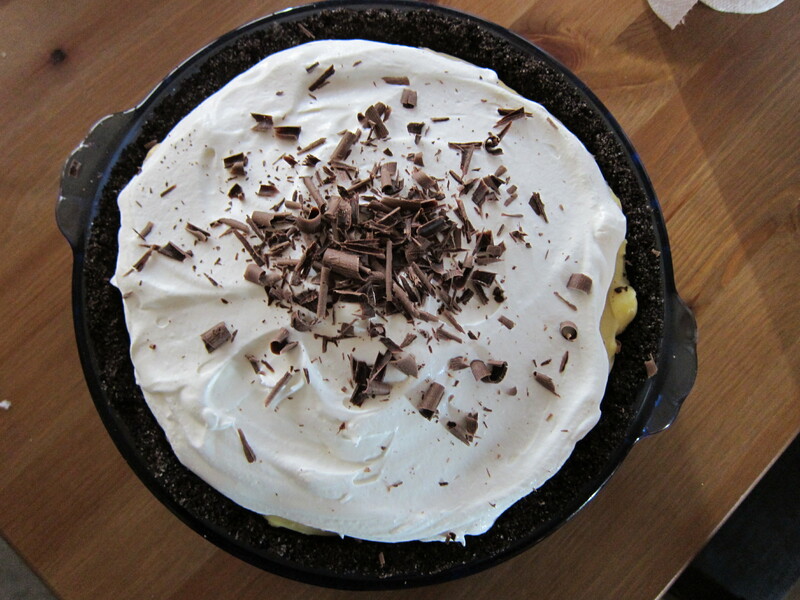 The chocolate and cream custards gives the pie a richness that is cut down by the fresh banana slices. The recipe called for graham crackers for the crust, but I thought that was confusing, since the name of the recipe is “Black-Bottom Banana Cream Pie”. 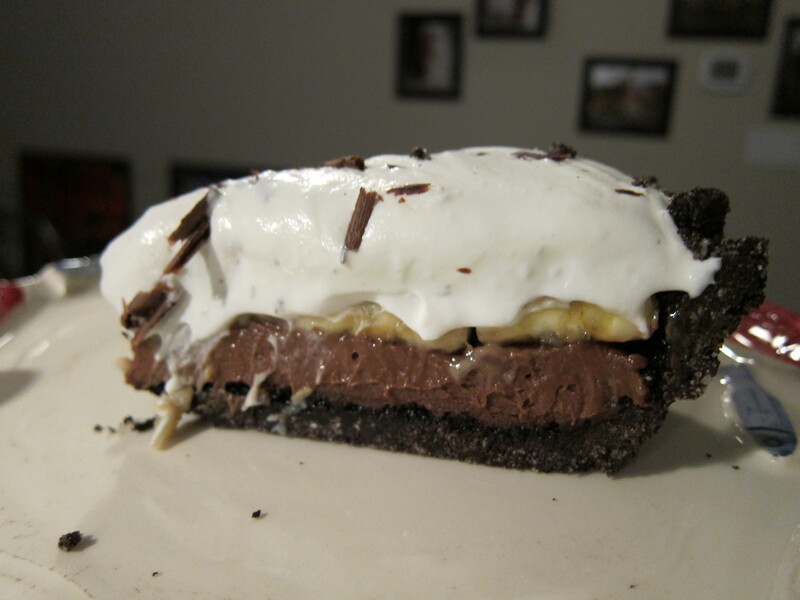 Instead, I used famous chocolate wafers as the ingredient for the crust, which I think made the pie even better. The light isn’t too good in the below photo but you can see that there is a very clean definition between each layer. I’m pretty particular about the structure of any dessert I make. I like my dessert to taste and look good. While I was doing some research for the BBQ, I came across this chef named Adam Perry Lang, who has a BBQ joint in NYC. Not knowing anything about the chef, and just by going off on some of the photos I saw and some articles from Food and Wine Magazine, I decided to cook all my BBQ sides from his recipe collection from his website. All three of these recipes can be made earlier in the day so you can focus all your time on the BBQ. 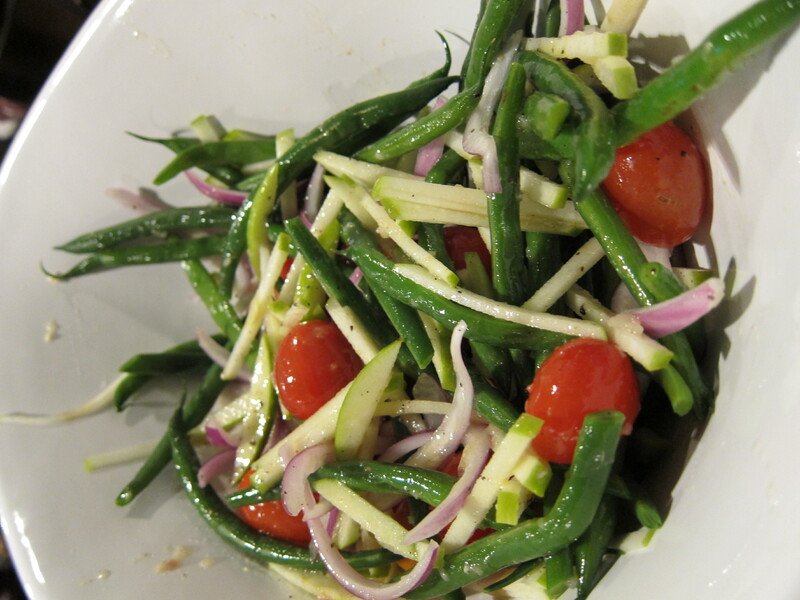 The next recipe I decided to make was his Green Bean and Tomato Salad with Green Apples and Cider Dressing. I love colorful food, and even though this recipe didn’t come with a photo, I was able to visualize the recipe just from the title. 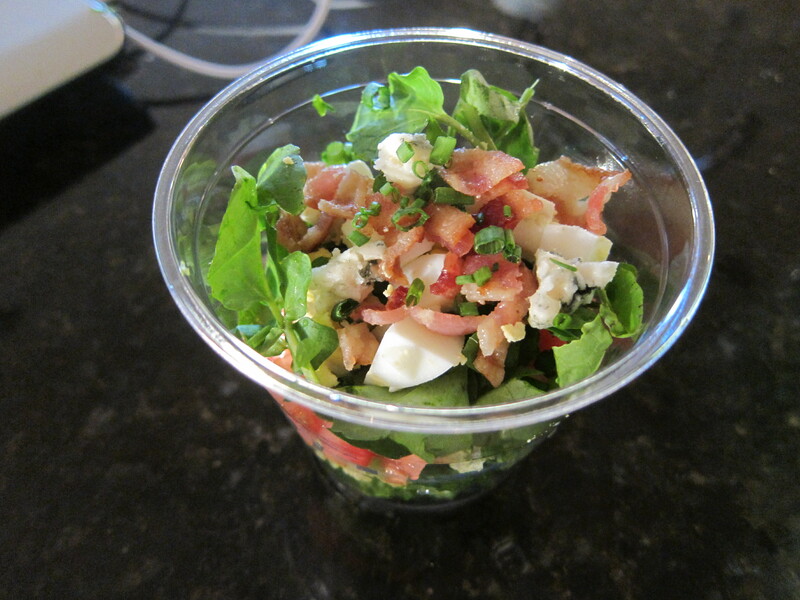 I also picked it because you always want a nice refreshing salad to go with heavy meat type of meals to break up the richness, and I never like traditional mayo based coleslaw. 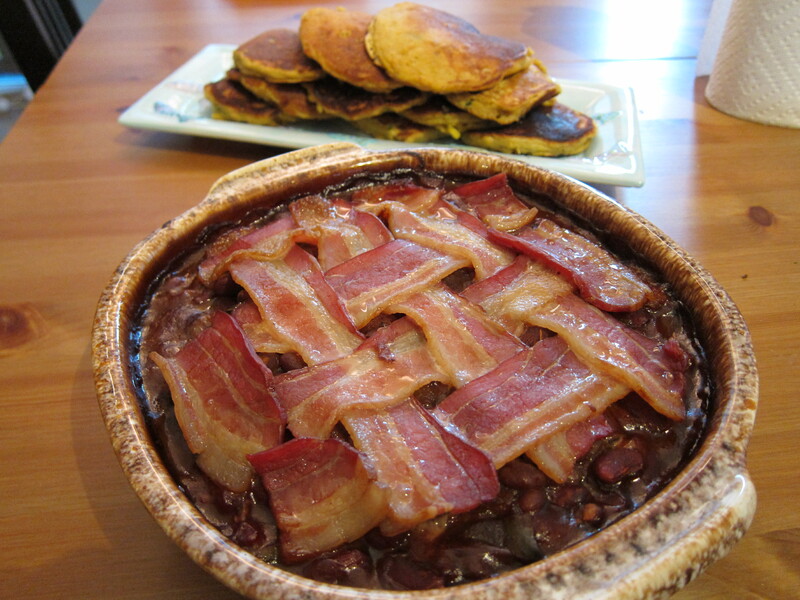 The final recipe I made from Adam Perry Lang is the Baked Three-Bean Casserole with Bacon from foodandwine.com. I’ve never made baked BBQ beans before, and this one was pretty fun to do. 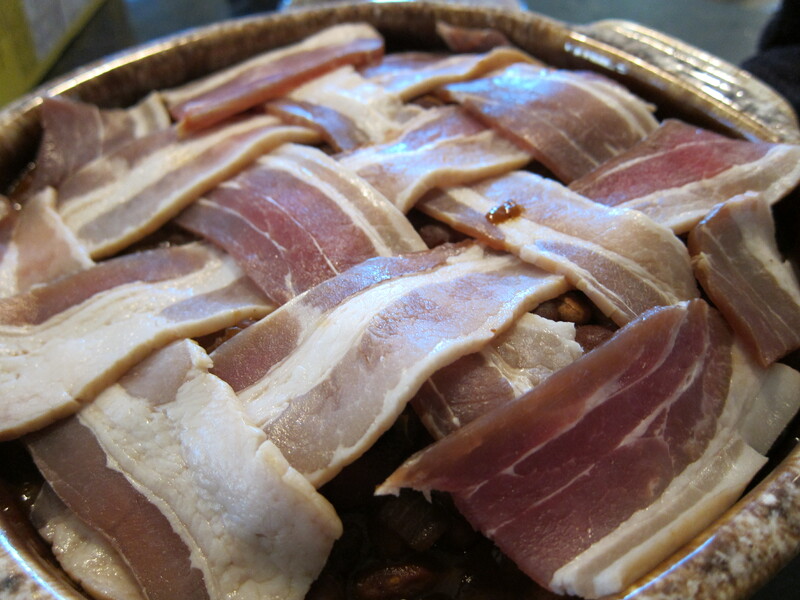 I lattice braided the Bacon so it looked like a pie. It was a bit sweet for my taste so I would add more hot sauce to it. I decided to try two types of rib recipes for this cookout. One is a recipe from Fatty Cue’s, a popular BBQ joint in NYC. The other is a Honey Glazed BBQ ribs recipe from Pok Pok, which is an modern Asian restaurant based out of Portland, OR. In choosing a rib, I used spare ribs instead of baby back. Spare ribs takes longer to cook, but I wanted to challenge myself and practice maintaining a constant bbq temperature for as long as possible. You don’t need a lot of charcoal to cook since the idea is to use low heat to develop flavor over time. I added hickory wood chips every 30-40 minutes for 3 hours, then I wrapped these ribs in foil and cooked for another 2 hours. For the final hour of cooking, I took the ribs out of the foil and placed them closer to the heat to give them a nice crispy finish. Both Rib recipes involved overnight marination. You want to marinate between 4 to 8 hours, but no longer since marinades with alcohol will start chemically breaking down the meat and will affect the cooking time. The Fatty Cue recipe has a fish sauce marinade, and the Pok Pok recipe had a whiskey based marinade. After 8 hours of marination, I took these ribs out of the marinade and just refrigerated them until it was close to the time of cooking. Also it’s a good idea to take the meat out of the fridge at least 30 – 1 hour before cooking so the meat is at room temperature when you put it on the grill. 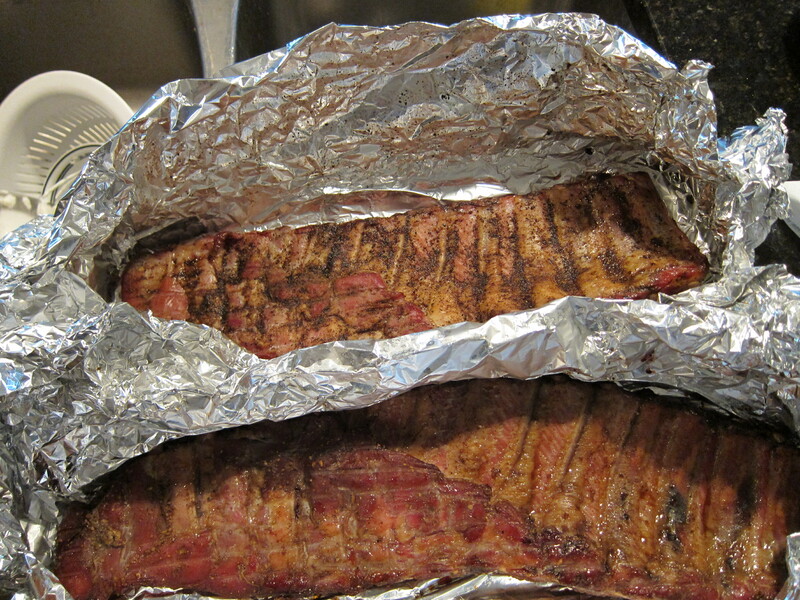 Above is a photo of the ribs after 3 hours of smoking, ready to go in their foil wraps. The top rack is the Fatty Cue recipe, the lower rack the Pok Pok recipe. The brownish powder you see on the top rack is made from toasted, and ground Indonesian Long Peppers (photo below). You can purchase these online and because they come in whole pods, they stay good for a long time, and when you need to use them, just dump them in a medium low heat pan and toast them until fragrant. You do need a spice grinder to grind these, and the flavor is a mix between curry and black pepper, and it’s got a good spicy kick to it. 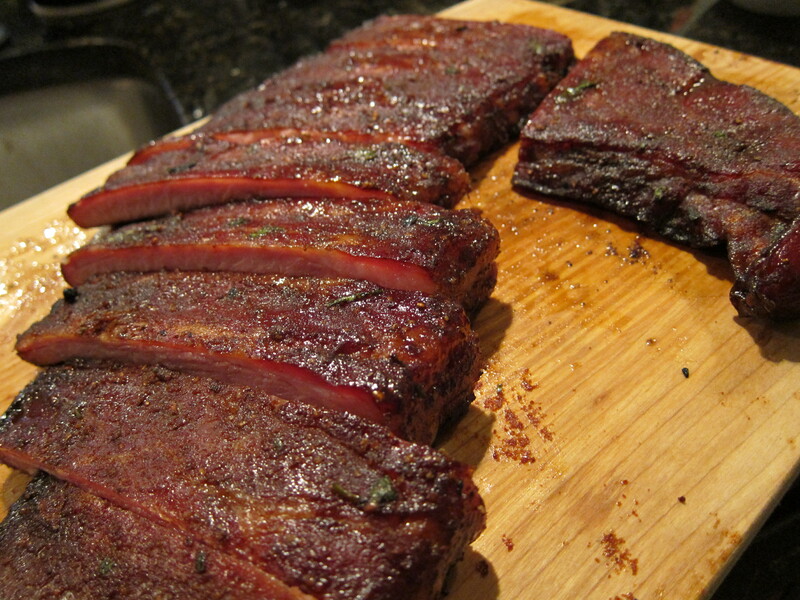 After 2 hours in the foil, the ribs will look like the below. This would be the time to base your ribs in BBQ sauce or dipping sauce if using. I started the cooking process at around 11:30AM, my fire didn’t get to the right temperature until 12:30, then I took off the meat at 6:30PM. It was a pretty windy day with a temperature of around 55F when I started, and by the time I finished, the wind had died down and the temperature had dropped at least 10F degrees. I think the ribs could have been cooked a bit longer for a more falling of the bones taste, but we were hungry and the flavour was there. Next time, I will definitely start earlier so I can cook longer. I love BBQ. There is something primitive about cooking meat over an open fire, especially when you are cooking ribs. After the meat is done and I am holding the rib with my bare hands and ripping the meat off with my teeth, I feel a connection with hunters and foragers from hundreds of thousand of years ago, who probably ate the same way that I did. As primitive as the idea of BBQ sounds, a bit of science still comes in if you want to make good BBQ. 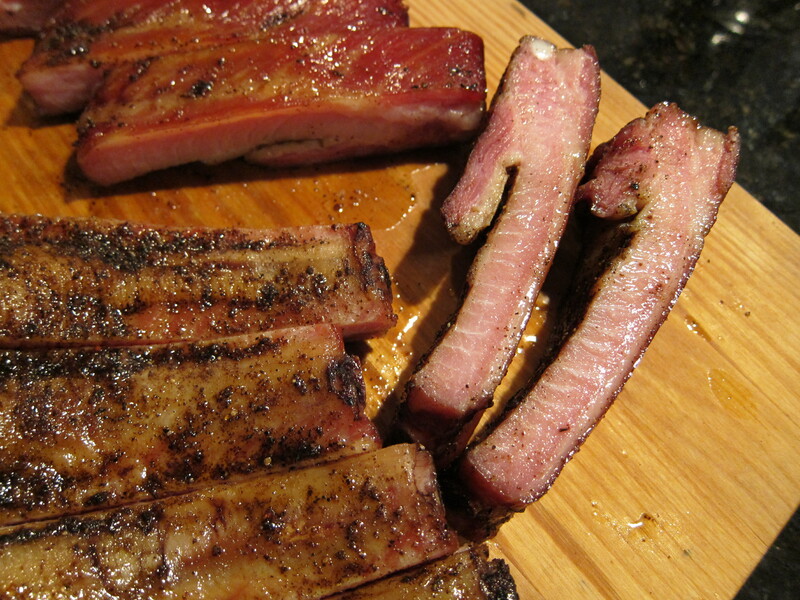 Temperature control and time are the two biggest factors in BBQing. Good BBQ takes time to cook, so it’s very important to be ready early in the day if you want to eat in the evening. Temperature control on a charcoal grill is unpredictable, and every time you start a fire, it’s different from the previous fire. Also outside factors like wind, weather, humidity all comes into play when you try to build the perfect fire. If you are using a gas grill, cooking temperature is a lot easier to control and maintain for long periods of time. There is a lot of debate out there over Charcoal vs. Gas grills, some say that the charcoal grills have better taste, others like the convenience of gas. I really wanted to learn how to grill on a Charcoal grill so after we moved to Austin, I purchased a Weber Kettle Grill. Since I bought the non-premium grill without a built in thermostat, I took my candy thermometer and stuck it through the round vent holes on the top of the grill. My method of cooking is indirect heat, which means half the grill is lit for a slow fire, and the meat is placed on the cooler half not directly over the coals. You want your meat cooking temperature to be around 220F-250F. It is very important to place the thermometer/vent opening directly over the area where the meat is so you can correctly gauge the temperature of cooking. If you measure 220F in your thermometer, but your measuring over the coals, that means your meat cooking temp is lower than 220F, and your meat will take longer to cook. There are a lot of good information online on how to start and maintain a fire, direct and indirect cooking, and smoking meats. I would recommend bbqrevolution.com, since they have a lot of step by step guidelines. For this BBQ I decided to smoke two types of spareribs ribs, total cooking time would be around 6 hours. 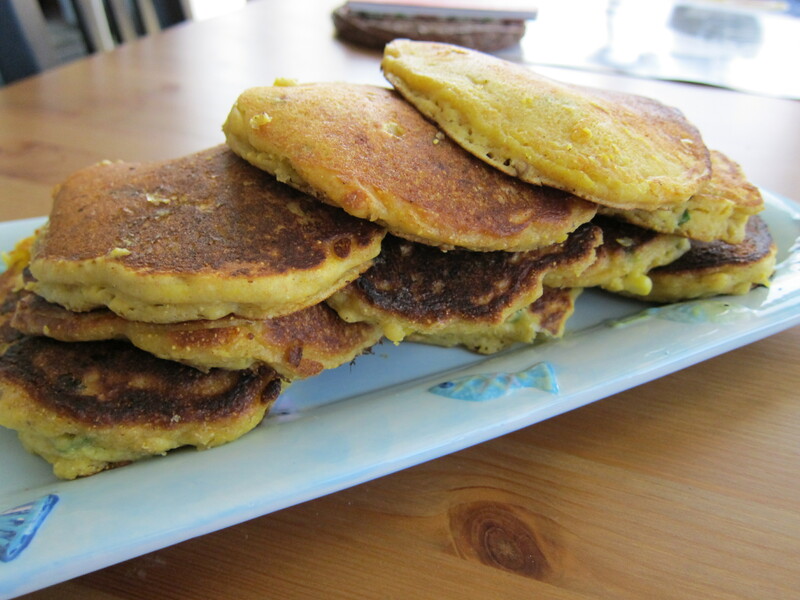 I also decided to make some corn cakes, baked beans, and green bean salad to go with the meal. It’s not a BBQ without some sort of pie, so I finished off the meal with a Banana Cream Pie. Here we are, at the last course of our beer tasting journey… And boy was it a journey. By now, your guests should be pleasantly wobbly, and you, as the Maitre D’ from Monty Python’s The Meaning Of Life, says “And Finally, monsieur, a wafer-thin Mint”. Your guests may feel like Mr.Creosote, but the Chimay Grande Reserve (Blue) from Belgium is probably the finest beer of the entire tasting, and not one to be missed. Chimay Blue is a strong beer at 9%, with stone fruit and chocolate/caramel sweetness. It’s a very creamy and smooth beer, and recognized as the best beer in the world by many. I paired Chimay Blue with a sticky toffee pudding style cake, made with pureed dates, toasted walnuts, and toffee sauce which is traditionally made from brown sugar, heavy cream, and butter. You can bake this cake as a whole and cut into bite size pieces for your guests, or baked them into mini cup cakes. Since your guests are most likely stuffed by this time of the beer tasting, they only need a bite of the cake to enhance the fruity and caramel flavours from the beer. With course 5, we move to the dessert portion of the beer tasting. The beer of choice is Fuller’s ESB (Extra Special Bitter) out of the UK. It’s not as bitter as you would expect something that is called “Extra Special Bitter”, but it is very very malty, almost syrupy, with caramel and nutty. With this beer, I decided to pair it with one of my favourite cakes to bake: the Chocolate Cake with Fleur De Sel Caramel Filling and roasted almonds. I have to admit I’m not a fan of dessert, usually because I don’t have a huge sweet tooth, and I prefer flavour over sweetness. However I LOVE making this cake. There are 4 layers of moist chocolate cake made with dutch pressed cocoa powder. Each layer is filled with a dark chocolate ganache, creamy salted caramel, and crushed salted almonds. Making it is a little bit like a construction project. Since the caramel filling tends to pour over the edge of the cake, you can build up a dam using the dark chocolate ganache frosting to keep it from going over. Also you can place the crushed almonds smartly to even out the cake if your cake layers aren’t cut evenly. The cake is pretty tall due to 8 total layers of components, so you want to make sure as you build it up, it’s as flat and as even as possible. I did not take a photo of the cake during the beer tasting, but because i’ve made the cake so many times before, I have included photos from previous documentations. Spaten Optimator is not a beer I would drink normally. It’s very dark and heavy with undertones of bread, malt, and brown sugar. Although I myself prefer lighter beer, I love this combination of the Optimator and the Byggybeef Sandwich. For the 3rd course, we moved on to a stronger tasting beer, the Ranger IPA made by the New Belgium Brewing Company from Colorado. The Ranger IPA can be a deceptive beer, the alcohol content is not significantly higher than normal beers, but it is one of those beers that’s a precursor to “What the F happened last night!” type of mornings if you are not careful. Like any IPA, it’s hoppy, but not overwhelmingly so. It has a very clean taste and a light lingering bitter taste. This beer is the perfect fit for something game-y, like goat or lamb or quail or even duck. 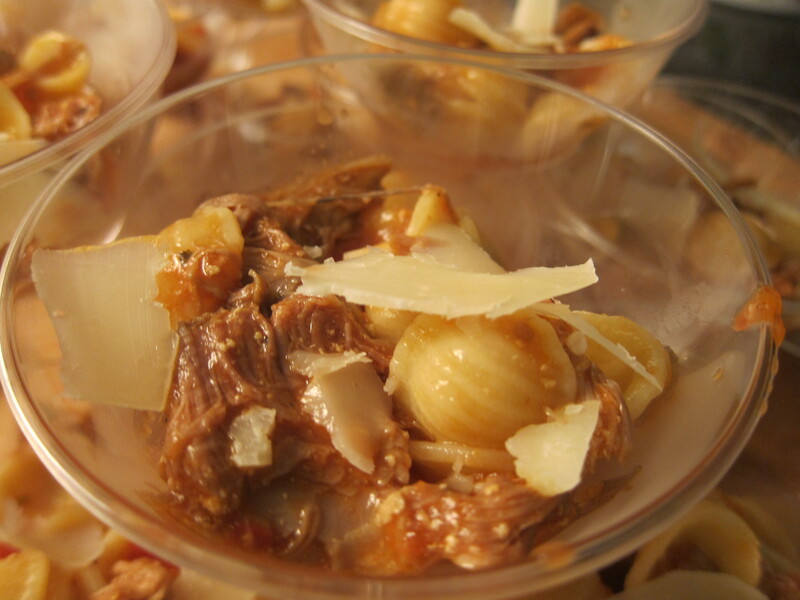 I slow roasted a shoulder of goat in whole milk for a few hours, then cooked a tomato based sauce around it. 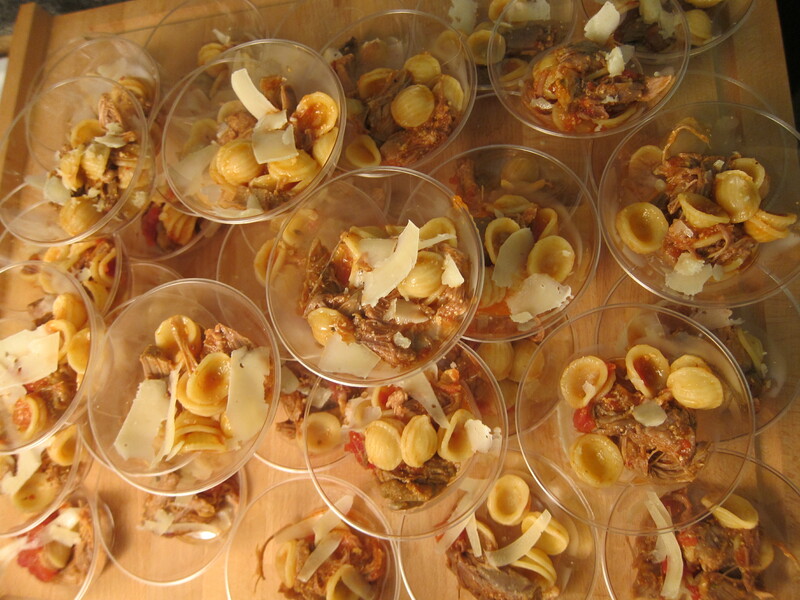 I paired it with Orecchiette pasta, which is italian for “little ear”, because I thought the little scoops of pasta would be perfect to for packing in bits of sauce. 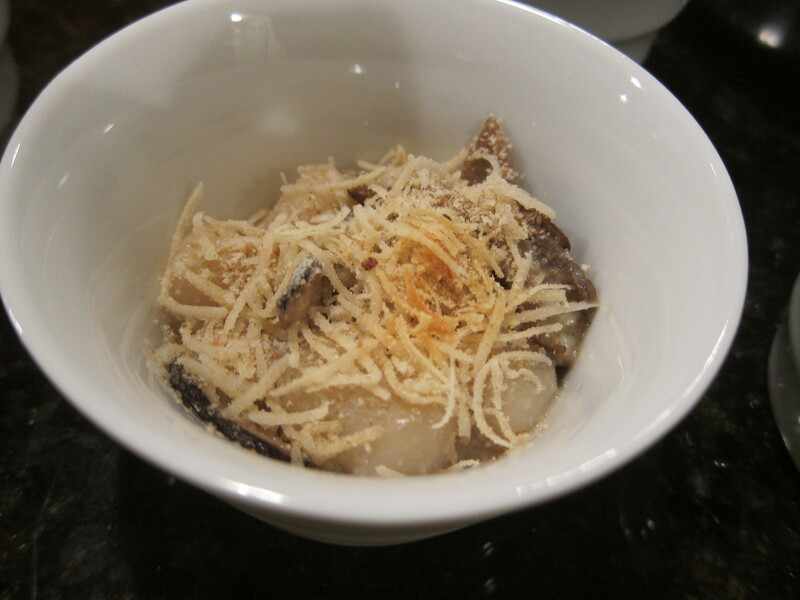 I then topped it with some shaved Pecorino Romano made from sheep’s milk. The bitterness from the beer does blend really well to tone down the creamyness of the sauce, while accentuating the game-y-ness of the baby goat. There are lots of local Mexican grocery stores that sell whole goat shoulders and legs. For a party of 15- 16 people, one 2-3 lb goat shoulder was enough to feed everyone with leftovers if you portion it right.